The Best Rates in the Business! Don’t delay! We have the Roll Off Rental for You Today. If you are looking to save a little money on junk removal in Houston, Discount Dumpster can help keep money in your pocket. We outline the rental terms with pricing that saves you more. Each dumpster is made to fit your budget, with delivery, pickup, disposal, and all applicable taxes bundled into the final cost. Our services come with no hidden surcharges, and you always know what you are paying for. Call us today to begin saving more. With a container on your residential or commercial property, you can get rid of clutter from your work site. We can help you decide which size dumpster will fit your project in a short phone call with our knowledgeable staff. Dumpsters are our passion and we hope our customers see that in every interaction. The 20 yard bin is common for landscaping. You can easily remove of construction rubbish such as wood and stone. The 20 yard dumpster is also ideal for disposing of yard debris. Smaller than the 40 yard, the 30 yard roll off is typical for full home renovations. Its bulky size allows the container to hold household waste with ease. With 30 cubic yards of room, it is often rented for small-scale demolitions. Our 40 yard receptacle is normal for contractors working on building planning. You can easily remove several tons of rubble with the 40 yard. It is ideal for contractors working on large-scale retrofits. Let Us Prove Why We Are The Best! 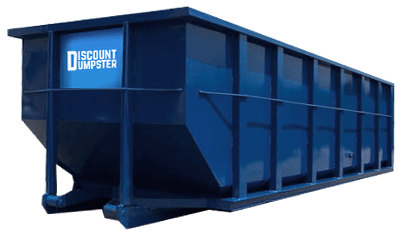 Discount Dumpster is proud to cater to all the specific needs of the customers in our area. We do so without negatively impacting the environment. Protecting the environment is extremely important to us, which is why we include green disposal methods into our rental agreement. Our company can offer advice on which items are acceptable and unacceptable for pickup. Call us today to find out a list of prohibited items that cannot be held in our roll off dumpsters.